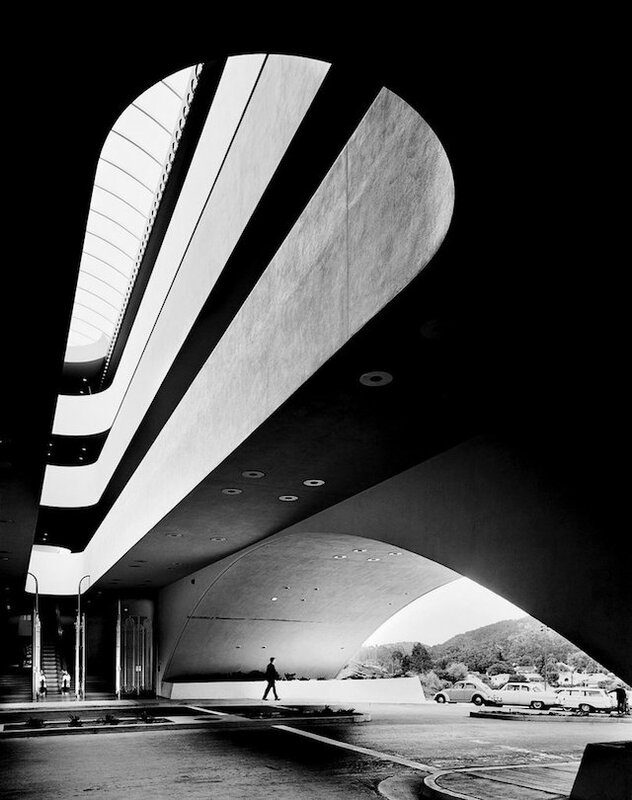 20th-century architectural photography was dominated by two towering figures who each had a significant impact on the promotion of mid-century modern architecture in America. Those two figures were Julius Shulman & Ezra Stoller. Both Shulman and Stoller were commercial photographers. Meaning, that their work was commissioned by architects and architectural publications for use commercially in magazines and portfolios. The work was never intended to be fine art. However, the work they produced was so compelling that prints from both photographers are now considered fine art. Shulman and Stoller had many similarities. Both shot large format film cameras. Both used camera movements with great precision to create perfect vertical and horizontal perspectives. Both were hugely influential in promoting mid-century modern architecture (Shulman in Los Angeles and Palm Springs, and Stoller in Chicago and New York). Both were film photographers in the pre-Photoshop (even pre-personal computer) era. Meaning image adjustments were limited to in-camera movements plus dodging, burning, retouching, and contrast in printing. Shulman and Stoller had their differences as well. 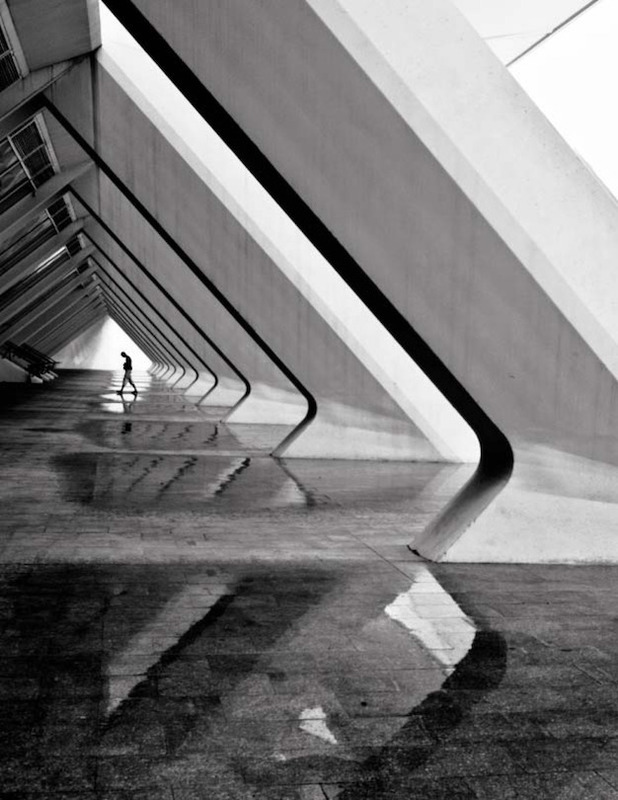 Shulman’s images often feature a single point perspective giving depth to the image that carries the viewer through the building. Stoller on the other hand, often times imbues a sense of grandeur in his buildings by employing a perspective where the viewer feels tiny next to the sheer size of the building. The film called Visual Acoustics (available on DVD and via various streaming services) is an excellent documentary covering the life and work of Julius Shulman and is recommended viewing for anyone interested in the historical look at architectural photography. You can watch the documentary here. Today, every major metropolitan city has several (presumably excellent) commercial architectural photographers. But it is unlikely that the work they’re producing will ever be considered fine art. Their work, while flattering to the architecture itself, is largely a realistic representation of the building presented in a very functional way. There are, however, a new breed of architectural photographers emerging today whose sole purpose is to create fine art from the outset. This point is a fundamental and philosophical difference between themselves and commercial architectural photographers. They’re here to create fine art. Period. And they’ve got no deadline to meet or client to serve. The function of the photo, from the time of inception, is to be fine art. Rather than a literal (yet flattering) view of the structures, this new breed of photographer uses long exposures combined with extensive post-processing to create visually stunning and often times surrealistic images. 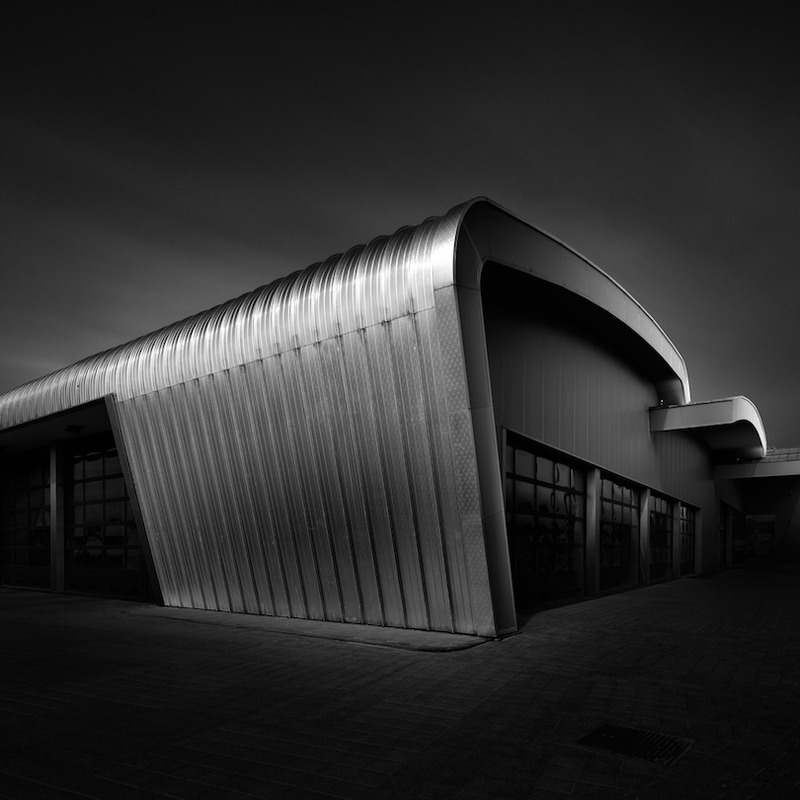 A prominent figure amongst today’s fine art architectural photographers is Joel Tjintjelaar (pronounced chin-che-laar). As an artist, Joel represents a specific crossroads between past, present and future. 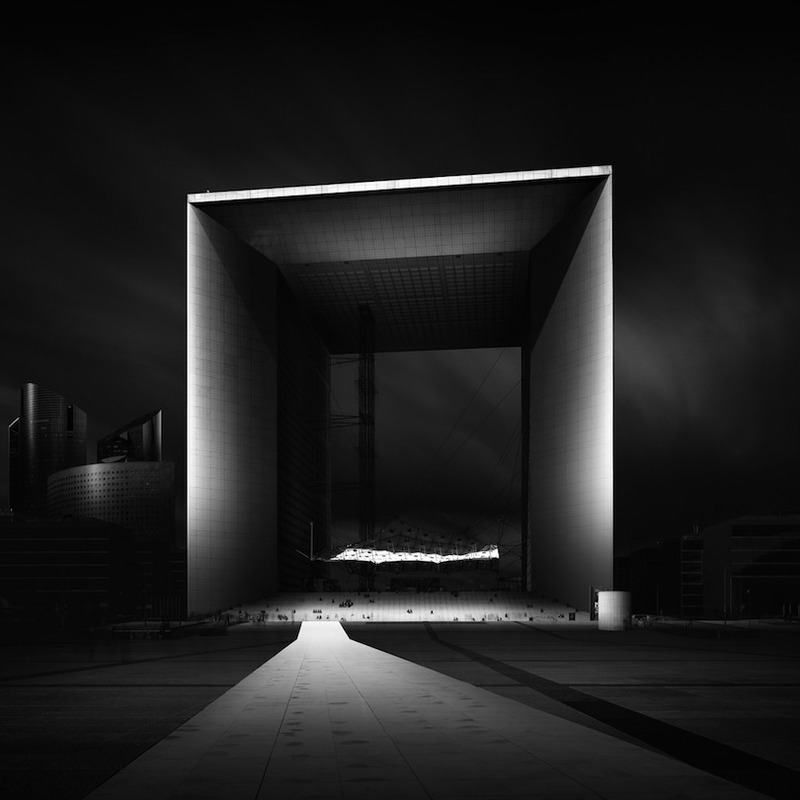 Joel’s work combines elements of classic architectural photography (such as Shulman and Stoller) with long exposure fine art techniques reminiscent of Michael Kenna. But unlike Kenna, who makes multi-hour film exposures at night, Joel uses 16 stops of ND to make 5-8 minute exposures during the day. Then Joel uses his Selective Gradient Masking (SGM) technique to transform otherwise dull mid-day light into otherworldly effects. Long exposure photography using 16 stop filters is now extremely popular, with many innovators and imitators using Joel’s SGM technique. Joel himself continues to innovate, and over the past couple of years has produced a series of fine-art images titled “Visual Acoustics.” With such an obvious homage to Julius Shulman, we decided to ask Joel a few questions about the past, present and future of architectural photography. LuLa: 20th Century architectural photography seems to be dominated by two individuals, Julius Shulman and Ezra Stoller. Each had their own unique style and approach. I wonder if you would comment on their body of work. JT: What I’m going to say is a very personal opinion and nothing more than that, but I think Shulman’s work went beyond Stoller’s work and it’s always Shulman people are referring to when talking about the great architectural photographers of the past century. It feels more dramatic and it evokes not only a feeling but also a way of living in a more emphatic way than Stoller’s work. Shulman created iconic photographs, not just one but a few, amongst other great photographs. While I feel Stoller created great photographs. Stoller was more the traditional architectural photographer while Shulman was the more artistic or fine art architectural photographer. There’s more adventure and a personal element in his work. More than just glorifying the architect and his creations, I feel Shulman also wanted to advocate and glorify a way of thinking and living through and in architectural creations and he did that by finding unusual, strong angles. By using almost distorted perspective lines. That part, the almost distorted perspective, is something I like to exploit in my own work as well. JT: I’ve given this question quite some thought in a recent article I wrote on the difference between real estate or commercial architectural photographers and fine art photographers who use architecture as an object in a symbolic way or for aesthetic purposes only, or both. What Shulman and Stoller did was to give voice and publicity to the creations of architects who hired them. That was their main assignment. But Shulman and Stoller did it in such a way that not only did it meet the expectations of the architects but also transcended it by giving voice to the human aspects of modern living in modernistic architecture. Something that was very visible in the famous Case Study House #22 by Shulman. The moment a photograph can be interpreted in other ways than what it formally depicts and conveys a mood or mental pattern, it becomes fine art. In my own work, the architectural objects are only there for symbolic and aesthetic reasons, it’s from the outset meant to be fine art. That’s the difference, although I suspect, but can never be sure, that Shulman intended to present more than just a photographic representation of the architect’s creations. If that is true then here’s a similarity with my work, but I think Shulman was so subtle about it that it worked for the architects and also for those who appreciated art. In my case, I don’t think architects will appreciate what I ‘did’ to their work. It has become totally my view on architecture – it’s a glorification of my view, not a glorification of the architect and his creation. LuLa: You created a series called Visual Acoustics, presumably in reference to Shulman’s concept of Visual Acoustics and the film about his life called Visual Acoustics. What from his work inspired you to call the series Visual Acoustics? JT: I was always an admirer of architect Louis Kahn and when I visited and photographed one of his creations, the Salk Institute in La Jolla, CA back in 2010, I was so impressed that I started studying his ideas. Kahn was not only a great architect but he also had very interesting philosophical ideas. One important recurring element in his thinking and his creations was the use of shadows and how shadows can invite you to retreat and contemplate, how shadows can evoke calmness and silence. Shadows as an analogy of the absence of noise. There has always been this relationship between sounds and architecture. Look at Goethe’s quote on architecture being frozen music. So when I came across the Visual Acoustics documentary by Erik Bricker, I knew it could only be a documentary on architecture, without even having any knowledge about it. That it was a documentary on the greatest architectural photographer of the past decades, prompted me to use the title of that documentary for my series. So it was a direct reference to the documentary and at the same time a reference to Kahn’s ideas on the acoustic effects of shadows. LuLa: Shulman & Stoller were limited to producing images on film throughout the course of their career. Meaning that in post-production, they were really only able to control dodging, burning, and contrast. How do you think the would have responded to the digital revolution, and even further, to seeing your Selective Gradient Masking technique? JT: It is always hard to say what the great photographers of the past century would have embraced digital photography. But I think it will be easier to answer this question if one separates the digital capturing from the digital post-processing. I believe there’s still a place for analog photography. The resolution you can get with a 4×5 Large Format still exceeds that of high-end digital backs like the PhaseOne 100MP. Let alone the 8×10 formats. But digital post-processing is a different thing. Everyone likes to speculate if Ansel Adams would’ve embraced that. Considering the substantial ‘manipulation’ he did to his photographs in the analog darkroom, I’m very tempted to say, yes, he would’ve embraced it. Totally. The accurate control of zones and tonal values, I think he would have loved that aspect. Same would apply to Shulman & Stoller to a certain degree. I have no clue what they would think of my Selective Gradient Masking technique. I think there are elements in there they would’ve appreciated but I’m sure they would come up with their own signature technique of post-processing. LuLa: The net effect of Shulman & Stoller’s work was the perpetuation of Mid Century Modern architecture. Shulman had a huge influence on the development of the greater Los Angeles and Palm Springs region, and Stoller had a similar influence in Chicago. What will be the lasting effect that you as an architectural photographer, or us as a collective group of photographers, will have going forward from today? JT: Shulman and Stoller were seminal architecture photographers, just like I think Norman McGrath was. Shulman especially influenced not only photographers but even architects. That is quite a feat. Comparing myself with them would not be appropriate and foolish. But if I were in the position to influence the future generation of photographers, or even architects, then the things I would love to see are the way shadows affect the way we perceive and experience architecture and the space we’re in. Which was actually something Louis Kahn propagated, so if this happens I wouldn’t have the illusion I had any part in its contribution. I would love to see in some way that when entering an architectural structure, it somehow gives us the illusion we’re also entering a different reality. In my more recent approach toward architecture, I try to glorify the way architecture changes dramatically the closer we get to it and try to capture it onto a photograph. It takes on proportions that are exaggerated and are almost impossible. This is the idea I try to express in my photographs. This feeling often disappears once you enter the building. More in general and not so much related to architecture I hope that the way we approach black and white photography is not so much of a second choice but a deliberate aesthetic choice above all others. It deserves to be approached in much more structured and deliberate ways. It’s still too much of a second choice. LuLa: In the history of photography there are watershed moments that change the course of history for photography. For example, the release of the Hasselblad camera, or Michael Kenna’s long exposure film work, or Ansel Adams invoking emotion in nature through photography. Your SGM technique was one of those moments. Do you think about the net effect that has had on fine art photography? And where are we – or you – going from here? JT: I feel very flattered that you compare my SGM technique with those watershed moments, I don’t think it was that important but I see where you’re coming from given the fact that I see many photographs these days that either use that SGM technique or are variations on it or use similar principles for specific results. But I want to emphasize that the technique I developed and advocated wasn’t entirely unique: all the tools I used were tools everyone used already. Some principles of my technique were already utilized by others in a slightly different way. The results I had could be created in different ways as well, and some did. The difference is that I think, I found an accessible and clear way of structuring all those digital techniques and bringing them together in such a way that it makes more sense together as a whole. And more importantly: the underlying principles to use a specific tool or to create a specific effect weren’t just tricks for the sake of tricks, but related directly to the basic principles of photography and the biology of seeing. It’s due to this that I think it inspired many other photographers to go beyond what was always held for acceptable. I feel like we’re just at the beginning of many other revolutionary techniques in photo editing. For example, I’ve found ways to improve on my SGM technique and it’s far more refined now compared to a few years ago. Creating selections, for example, is less time consuming now and is semi-automated and far more accurate and subtle, using… gradient tools! I want to automate even more and am working on software to create better B&W photographs based on my SGM technique. All with the aim to make photo editing more intuitive, less time consuming and more precise and subtle, so we, as photographers, can focus on the art of shooting photos more.